This color combo had me stumped for a bit, but I decided to just keep it simple...and the card pretty much made itself! I am in love with buttons right now and this row of buttons just makes me happy!! I know, i'm a dork. hee hee!! And my most favorite butterfly cut from my Cricut. I could use this cut again and again and again. That's about it for today!! I'm so happy it's Wednesday...almost the weekend. Thanks for stopping by! Mini Sirloin Burgers!!!!! Sing it if you know it!! Okay, that commerical really drives me insane. It's for Jack-in-the-box and their new mini burgers. My kids come running at top speed when they hear the music. Now I know how my mom felt when she used to tell US that commercials drove her crazy!!! We used to love them when I was little and my kids are no exception. Although we are probably the last people on the planet NOT to have TiVo...my kids would want to skip the show and only watch the commercials!! Ha Ha! Okay...back to the original post. I made these...mini sirloin burger...cupcakes!!! Just a yellow cupcake with a mini brownie inbetween layers. A little ketchup and mustard buttercream frosting oozing out...and it looks just like a little burger! The only thing better would have been little sesame seeds on the top. I contemplated driving to the store last night at 10pm...but then didn't. How cute would these be at your next BBQ or family picnic????? Today is the day! The first ever Scrap That Blog Hop!!! Please start at the Scrap That Blog to get all the details. You will need to comment on the main blog and all the DT blogs to get into the prize drawing, and you don't want to miss that. 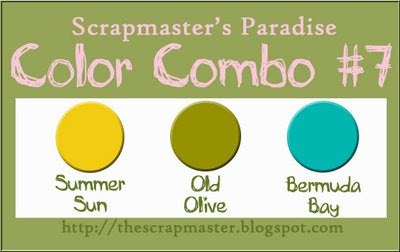 You might win a Guest Design spot at Scrap That! By adding buttons to the middle of my tree, the tree now has some dimension that makes it pop as the focal point on the card. Great little embellies! My second card uses buttons for the actual flowers. This is a stamp I have, but you could easily hand draw the flower stems or use patterned paper strips or ribbon to make the stems. The buttons add that pop of dimension that makes the flowers come to life! Add some twine in the middle of the buttons and you have yourself a great little card! Now HOP on over to all the other DT member blogs to see what they have done with buttons. And don't forgot to leave a comment. Have a great Friday!! I had a hard time matching up this blue. I love it, it's bright and summery but none of my paper really did it justice. Regardless, I came up with these cards. They are tall and skinny, about 3 inches x 5 inches. They still fit in a standard envie!! I stamped the background with versamark. Here they are!! I'm on the fence whether I like them or not, LOL!! I'm not sure about the green, but they are finished so I'm posting them! 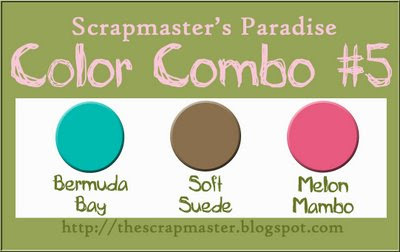 I also made the top 5 last week for last week's color combo...woohoo!! Why not play along this week??? Let me know if you do, I want to check it out. Thanks for stopping by!! If you've been around here at all, you know I loooove to bake!! And this weekend was no exception. I've been on a mint kick lately and decided to go for it with these chocolate mint cupcakes. I used The Pioneer Woman's Best Chocolate Cake EVER recipe, but made it into cupcakes instead of a sheet cake. Oh, and left out the pecans. I made my standard buttercream frosting recipe, added some mint extract, some blue and green coloring and piped it big and fat on top of the cupacke. Added an Andes mint candy and there you have it!! YUM!! My kids also love to bake and we have quite a few kids cookbooks. My daughter was looking through one and I told her to bookmark all the recipes she wanted to try. Well...every page was bookmarked! Hee hee!! But this weekend she decided on mini cherry pies. It was just pie dough crust, cut out and put in muffin tins. We spooned in cherry pie filling, then cut out shapes and letters for the top. Easy peasy!! Seriously good when you heat them up and add a big dollop of vanilla bean ice cream!!! Yeah for the weekend!!! I got to see Harry Potter Friday afternoon and it was fantastic!! The special effects really blew me away. I don't get out to the movies much, but it was a great movie with great effects. I can't wait for the last movies (since they are splitting the last book into 2 movies!). Friday night I scrapped with girlfriends, but it was more like chatting and eating and having cocktails because I didn't even complete 1 layout. Whoops! Today we spent all day at the Natural History Museum. Both kids just loved it, like out-of-their-minds loved it. Everything illicted a reaction of "SO cool!! ", "Awesome", "You HAVE to see this, MOM!!". It was pretty cool to see them so excited. I want to share this altered frame I made for my MIL for her birthday/Mother's Day back in May. I used scraps left over from the May Color Me Daisy Kit, some photos of my MIL and her grandkids, and a frame from Michaels. I just filled each opening with either a photo or embellished paper. I kinda wished I made one for myself, LOL!! Hope you are having a great weekend. We have hot hot hot weather, so tomorrow i'm sure we will hit the pool. Thanks for stopping by!! This week there were four colors to use...not easy! And here is my card. The colors in the photo look a bit wonky, but the green really is kiwi kiss...trust me! LOL!! That's about it for me today. My mojo has been missing and I am feeling very uncreative. I am scrapping with friends on Friday night, so it hope it shows up! Thanks for stopping by! I took the kids to a local splash park this weekend and they had a ball. It was soooo crowded so it took a little bit for them to really jump in and start to play. But once they did, it was impossible to get them OUT!! Kevin sure LOVED that water gun!!! He waited patiently in line for his turn and then went crazy with it! I made this mini album today for a friend of mine. Her sweet daughter is turning 3 tomorrow and having a park princess party. Everytime she comes over, she looooves to put on this ladybug costume from our dress-up box. She is so cute running all over the yard as a little ladybug! I cut the ladybug shape out on my Cricut and created this Ladybug mini album. Very simple with mostly photos. My girlfriend is not a scrapbooker so I think she'll appreciate the simplicity. I cut circles for the inside pages and just bound it all together with red ribbon. Easy peasy!! So today's Friday favorites is dedicated to my kids. This is one of their most favorite things in the whole world...when daddy makes them fruit animals!!! Craig makes the best fruit animals and he has made so many of them. And let me tell you, he has never made a duplicate! Today were little baby birds with watermelon, peaches, and blueberries. I guessed penguins and I was pretty close. I'll have to dig out the old photos from last summer, but he does such a great job. Mangos make great turtle shells, apples make great ladybugs...you get the idea. They just love them so much and what a sweet dad!!! Hope you're having a great Friday. Hopefully there will be more fruit animals to share this summer!! Yes, I realize that's a pepsi in the photo, but that's all I had!! I got this idea from a friend of mine who said...Hey, can you make me a cupcake with Captian Morgan's in it??? So I searched around for recipes. I found a good coke cupcake recipe that I used, but couldn't really find a rum frosting one that I liked. So I used my old standby vanilla buttercream recipe and added about 4 tablespoons of Malibu rum. The frosting was good, you could taste the rum without being overwhelming. 1. In stand mixer fitted with a flat beater, combine flour and sugar; set aside. In saucepan, combine margarine, cola and cocoa and bring to a boil. 2. Remove pan from heat and pour over flour and sugar. Mix thoroughly to combine. Add buttermilk, eggs, baking soda, vanilla. Mix well. 3. Fill cupcake liners about 1/2-2/3 full and bake for about 17-20 minutes or until toothpick inserted in center comes out clean. Let cool before frost. I did NOT use marshmallows. There is something to be said for reading the ENTIRE ingredient list before actually starting to bake. I got the marshmallow part and said...oh crap! I don't have any of those!! They turned out just fine. It was a fun and different cupcake for sure! The cake was so moist, I think that's because of the soda in the mix. And the frosting...really really good. Even good eaten just on the spoon because there was some left over. Don't judge me, I couldn't let it go to waste!!! 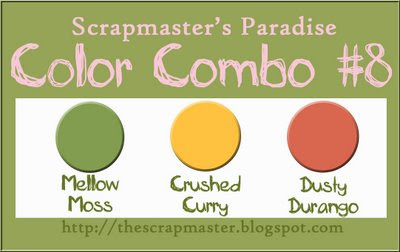 Here is my card for the #5 color combo at Scrapmaster's Paradise. I broke out my Star Prints set from Papertrey Ink and used my punch to punch out the stars after stamping. Easy Peasy!! I didn't have the exact colors that were asked for, but I hope I came close! I popped up the middle star with some foam squares to add a little bit more dimension. I also added some buttons and bling. Love that bling in a line from Hero Arts. I'm almost out of it, boo! I need to find some more!! I had fun with this color combo. I love using stamps that I haven't used in a while. You should definitely check out the color combos. Gives me a little push to design something different. Come over and check out what everybody else is creating, too. Thanks for stopping by! I wanted to share another layout I did with the July Kit from Color Me Daisy, Summertime Fun. The kit includes this fun shaped paper by Fancy Pants and some sheer butterflies from Maya Road. For the butterfly, I took three different colors of crayons and using my trusty Aim-n-Flame, melted the crayon wax and dripped it on the butterfly. After a few layers, it turned into this cool mosaic pattern. I also cut little circles to make my tree top and layered them with some buttons. I like the end result!! Better go grab a kit for yourself before they are all sold out!! 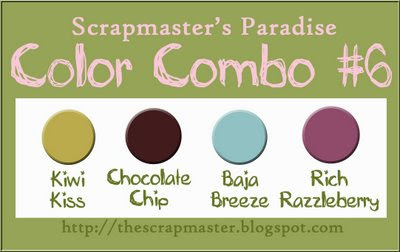 I am working the next Scrapmaster's Paradise Color Challenge and hopefully will be posting it tomorrow. Hope you're all having a good week! Hi everyone! We had a great 3rd of July celebration and a great visit with my sister and her husband. We went to a great neighborhood party for the 3rd of July (our little town does fireworks on the 3rd, have no idea why...maybe it's cheaper??). Lots of good food, friends, and fireworks! I made THIS salad and it really was the best salad EVER. And yes, i'm a big ol' dork and took a photo of it. We spent the morning before the party making this AWESOME Uncle Sam hat for my brother-in-law. He said he would wear a hat if we made one. My sister and I kicked into crafty overdrive and came up with the hat (along with some help from Kevin and Kayla). Craig decided to wear the pinata on his head at some point. Look at the 2 Uncle Sam's!! Here's Kevin taking down the other pinata. Yes, there were 2 pinatas!! And some fireworks. This was my first year attempting to take any photos. I turned out with alot of really bad photos and one or two good ones. Hope you all had a great holiday celebrating with your friends and family! !